Online fashion store Dolch launched a new collection of women’s sunglasses, including aviator shades, cat eye glasses, and various other models. All glasses feature high UV protection and modern, stylish designs. Dolch, an online fashion store specializing in high-quality sunglasses, announced an update of its collection to feature a variety of aviator shades, cat eye glasses, and other women’s fashion eyewear. The collection includes high-quality sunglasses with antiglare and UV protection, the wide range of styles and colors making it ideal for a variety of tastes and styles. More information can be found at https://dolch.store. Sunglasses are some of the most popular fashion accessories, being designed to complement any outfit and bring a touch of style to any look. Their uses, however, are not limited to fashion only, sunglasses being widely used to protect the eye against harmful UV radiation. Dolch is an online store offering a wide range of high-quality sunglasses for women. Store visitors will find a variety of aviator shades available in blue, purple, brown, pink and other colors. The Yves collection of oversized shades features pilot-style sunglasses with polycarbonate lenses and alloy frames, making them durable and easy to maintain. The UV 400 protection grade makes them ideal for anyone looking for an effective way to keep UV rays away, and the 64 mm lens height allows for optimal visibility. The Coco collection includes a variety of antiglare aviator shades in brown, purple, light blue, and other colors. These modern rimless sunglasses come with antiglare lenses for increased UV protection, being ideal for everything from shopping to fishing and traveling. 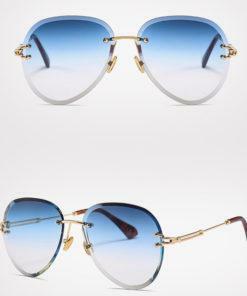 Dolch also provides cat eye sunglasses, round shades and various other models.